Padraig Harrinton is in Singapore this week. Next week he will be back at one of his favourite venues (above) for the UBS Kong Open. Picture © Getty ImagesPadraig Harrington was once asked if he felt he was “special” - a breed apart. Ask around and you’ll hear other words, such as “mad” or “obsessed”, which is the title of a new book by journalist Paul Keane, chronicling the early career of the Dubliner, his major wins and his current battle to get back to the top of the game. It’s an essential compendium for Harrington fans and students of the game with even a passing interest in what makes a great sportsman tick. Reading “Obsessed” is like flicking through a scrapbook of cuttings and short videos of Harrington’s career in the company of those who know him well. It’s a fine effort that brings the memories, good and bad, flooding back. One wonders if even Harrington himself could ever capture the essence of his quest but the author has done a sterling job of capturing it. Reading the book, I was reminded that Harrington is neither mad nor completely obsessed. Complicated doesn’t do him justice either. Nor does quixotic. As his former coach Bob Torrance points out - and let’s face it, Torrance will always be Padraig Harrington’s coach, no matter how long he remains with Pete Cowen - you can strive for perfection but you will never attain it. And that’s all that Harrington does. He’s like a man perennially toiling over a beloved car, tuning it and polishing it, replacing worn out parts with new components or homespun inventions. He’s not quite TV detective Tony Petrocelli, who lived in a trailer in the desert and never quite got around to finishing his dream home, but there’s never and end in sight. Even now, when his long game is in wonderful shape, his putting is giving him headaches. As he once said, he’s like that circus performer trying to keep all the plates spinning on their poles. Harrington once confessed that he was fascinated by Howard Hughes who once dismantled an expensive motor car to see how it worked before trying to put it back together again. Catching up with Harrington can often be fun. If you’re up for it, you’re guaranteed at least a good argument or a decent tabloid story line. That said, you are unlikely to put phone down thinking you have reached any kind of closure on a particular subject. It’s never completely simple. I hadn’t managed to speak to the Dubliner since he captured the PGA Grand Slam of Golf in Bermuda nearly two weeks ago - his first win of any kind since October 2010. A request for a chat could come within seconds or hours or days. Or never at all. This time it was seconds. He was on his iPhone in his hotel in Singapore. This time it was a video call. FaceTime. I wasn’t quite in evening dress, but at least I was dressed! He hasn’t shaved. It’s nine at night but he’s in good form. He’s just spent three days working with Dave Alred on his routines. He’s looking for at least one win from his last three starts of the year - the Barclays Singapore Open, the UBS Hong Kong Open and the DP World Championship in Dubai before putting away his suitcases, not his clubs, for around nine weeks. The most important thing about Harrington’s win in the PGA Grand Slam of Golf was that he had an eight-foot putt on the 16th hole on the second day to go three shots clear and holed it. It meant a lot. “Winning is a habit,” Harrington said of his win in the 36-hole strokeplay event, where he was a late stand in for Open champion Ernie Els against Masters winner Bubba Watson, US Open champion Webb Simpson and Keegan Bradley, who was substituting US PGA winner Rory McIlroy. “It’s not the same as winning a four-round tournament and it’s not the same as winning a full field event. “But you still feel the same way with nine holes to go as you would in a 72-hole event. So it’s a good habit to get into and a nice positive. I am making an effort to take as much as I can from it. “There were a lot of good things about it but it was all about getting the ball in the hole. That was probably the most positive thing about the tournament. “It was like the old me. It was all about getting the ball in the hole and I didn’t get in my own way because of that. The difference between that putt and any other putt was that that putt was effectively to win a tournament, not a 10 footer to go two under in a regular event somewhere. His goal now is to get his putting back to where it was at his peak so he can attack the 2013 season with high hopes of more major wins. By finishing 13th in the stroke average category on the PGA Tour this year (69.73 when he was 88th last year with 70.81), his long game is clearly better than ever. The Dubliner took 70 putts over the two rounds in Singapore last season as he missed the cut by five shots in what he admits was one of his worst ever performances on tour. The model pro, he’s forgotten why he played so poorly but simply puts it down to having a bad week on a course where he was beaten in a play-off for the title by Jeev Milkha Singh in 2008. He’s still excited about his game, having put his finger on what’s been ailing his putting for more than a year, he believes he’s finally getting to grips with solving the problem. Despite racking up 14 Top-20 finishes this year, Harrington knows that in terms of world ranking points, consistency is worth little. He needs a big win that would propel him back into the world’s top 50. And he knows that means holing more putts, like that crucial par saver in Bermuda. “Technically my putting stroke got a little too long,” he said. “It is a question of transferring it back to getting a little more hit, a little more rap in the putting stroke, which I can do very nicely. “The transition to make it all automatic isn’t quite there yet. It’s taken longer than I expected for it to become second nature but it’s getting there. Hopefully over the next couple of weeks and into next year it will all be seamless. Making it back into the world’s top 50 is very much within reach this side of Christmas and would make it easier to schedule in the early part of next season. As things stand, he’s likely to have around nine weeks off to work on his putting and maintain his sharpness in the long game, chipping, wedge and bunker play. He’s unlikely to start back at the Volvo Golf Champions in Durban in South Africa (January 10-13), where he earned his first cheque as a rookie tour pro by finishing tied for 49th in the 1996 FNB Players Championship. Who knows, he may finally get the chance to fulfill a longstanding ambition to tee it up in front of those raucous crowds in the Waste Management Phoenix Open, the week before he defends the team title with Dermot Desmond in the AT&T Pebble Beach Pro-Am. “Phoenix could be on the agenda next year because it’s opposite Dubai and it’s a long way from Dubai to California,” he said. If he doesn’t manage a win between now and then, what better place than Phoenix for a resurrection. 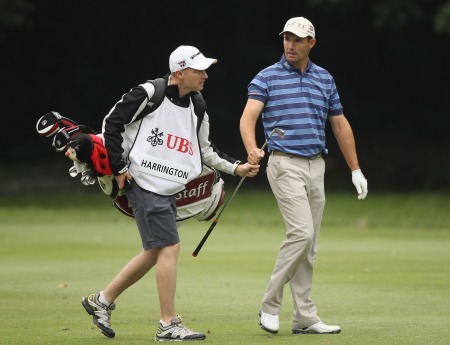 Padraig Harrington is accustomed to firsts. In 2007 he became the first player from the Republic of Ireland to win the Open, then the following year at Royal Birkdale he became the first European since James Braid in 1906 to retain the Claret Jug. Padraig Harrington will be gritting his teeth in Hong Kong this week. Picture www.golffile.iePadraig Harrington will be kung-fu fighting for his short term future in Hong Kong this week.